PROPHECIES AND PREDICTIONS OF THE FUTURE FOR 2019 - 2020 - 2021 - 2022. THE END TIMES EVENTS AND DISASTERS COULD OCCUR IN 2019 - 2020 - 2021 - 2022: THE ANTICHRIST PUTIN IS ATTEMPTING TO TAKE OVER THE WORLD. POSSIBLY RUSSIA OR NORTH KOREA STARTS A NUCLEAR WAR, AND THE FOUR HORSEMEN OF THE APOCALYPSE RIDING IN 2019 - 2020 - 2021 -2022. THE FOURTH HORSEMAN OF THE APOCALYPSE DEATH RIDING. IN 2019 - 2022 THE FOUR HORSEMEN OF THE APOCALYPSE RIDE: THE FIRST HORSEMAN THE ANTICHRIST 666 IS PUTIN, THE SECOND HORSEMAN WAR IN UKRAINE, RUSSIA, NORTH KOREA - SOUTH KOREA NUCLEAR WAR, IRAQ WITH ISIS TERRORISTS, SYRIA, AND MUSLIM ISIS TERRORIST ATTACKS IN EUROPE, THE FOURTH DEATH AS DISEASE EPIDEMICS - POSSIBLY EBOLA SARS OR BIRD FLU or ZIKA VIRUS, POSSIBLY DEATH MAY RIDE. PUTIN IS THE THIRD ANTICHRIST OF THE NOSTRADAMUS PROPHECIES, THE FIRST TWO WERE NAPOLEON AND HITLER. RUSSIA STARTS A NUCLEAR WAR OVER SYRIA? SOON MAY COME GIANT EARTHQUAKES, VOLCANOES, TSUNAMIS, GIANT SOLAR FLARES, EPIDEMICS, THE RISE OF THE ANTICHRIST, WARS, MORE ASTEROIDS. GIANT EARTHQUAKES AND VOLCANOES IN 2019 -2022. WATCH OUT FOR GIANT VOLCANO ERUPTIONS AND EARTHQUAKES MAGNITUDE 7, 8 AND 9 AROUND THE WORLD IN 2019 - 2022. ALIENS MAY BE SETTING OFF VOLCANOES TO SLOW DOWN GLOBAL WARMING TEMPERATURE RISE. PUTIN THE ANTICHRIST IN RUSSIA IS ATTEMPTING TO TAKE OVER THE WORLD, DESTROYING NATO. LATER INVADES UKRAINE AND OTHER FORMER SOVIET UNION COUNTRIES TO ANNEX INTO RUSSIA, SEE THE CALENDAR PAGE ON IT. PUTIN OR NORTH KOREA COULD LAUNCH MISSILES AND START WORLD WAR 3 BY 2022. A METEOR HITTING IN RUSSIA MAY RELATE TO THE ANTICHRIST RISING TO POWER THERE AS PUTIN. AN ASTEROID DEFENSE IS NEEDED, MORE MAY HIT SOON. SEE THIS PAGE. ALIENS LANDING ON EARTH 2021 - 2022 MAY BE PROPHESIED IN BIBLE PROPHECIES AND NOSTRADAMUS PROPHECIES, SEE THE CALENDAR AND NOSTRADAMUS PAGES ON IT. PSALM 121 MAY INDICATE THAT 2021 IS THE YEAR OF ALIEN INVASION, SEE THE CALENDAR PAGE ON THIS! THE 4 HORSEMEN (THE ANTICHRIST PUTIN, WAR, ECONOMIC CHAOS, DEATH) ARE RIDING. ALSO: RETURN OF CHRIST, BATTLE OF ARMAGEDDON, DEFEAT OF THE ANTICHRIST, POSSIBLE ALIEN UFO INVASION OF EARTH IN 2020 - 2022! January 2018 Volcano eruptions: Papua New Guinea volcano eruption. Volcano eruption Mount Mayon in Phillipines. Could aliens be setting off volcanoes to put volcanic dust into the atmosphere to slow down global warming temperature rise? There are different methods of predicting the future - such as psychics who have psychic predictions where they actually see the future, Nostradamus was this psychic type of prophet. For my predictions I use Astrology, combined with Bible prophecy including the Book of Revelation, Nostradamus prophecies, and numerical methods. And for me there may be a psychic element also in my predictions for 2019 to 2020. This web site includes a discussion of the Book of Revelation, the last chapter of the Bible, which includes a description of a catastrophic sequence of events that some people believe are occurring now, and may occur in 2019 - 2020 - 2021 - 2022. These include earthquakes (such as the giant Indonesia earthquake and tidal wave in Dec. 2004 and the Japan magnitude 9 quake in 2011), wars, diseases (such as Bird or Swine Flu), economic chaos, weather changes (global warming and superstorms like Hurricane Katrina), and the rise to power of an evil dictator, called the Antichrist. He is identified by the number 666. Also in Revelation there are the four horsemen of the Apocalypse -- the Antichrist, the conqueror, on a white horse; war, on a red horse; economic depression, on a black horse; and death rides a pale horse, and hell rides with him. The Four Horsemen of the Apocalypse are said to ride as the Antichrist rises to power. Also in Revelation, there are descriptions of angels, but the angel there can be an angel of death, carrying plagues. There is also a description in Revelation 8 of what appears to be an asteroid or comet hitting earth, destroying much of life on earth. In Revelation Chapter 1: John, on the island of Patmos near Greece, sees Christ, as he is exiled on this island after the death of Christ. Christ appears among 7 golden candlesticks. This may be the John who was Christ's disciple, or it could be another John. Christ shows John visions of events to occur in the distant future, during a period of time in the future called the End Times. 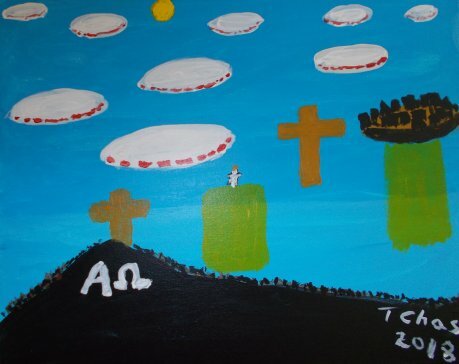 Christ refers to himself as "Alpha and Omega" to John in this vision, and since Alpha in Greek represents the number 1, and Omega represents 800, this gives us a number of 801. 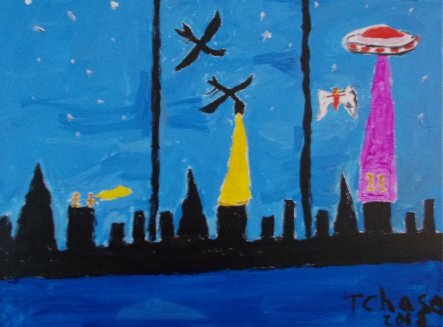 My painting shows Christ among the 7 golden candlesticks, with UFOs and an angel in the background. 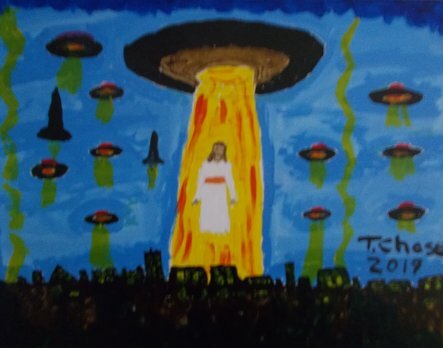 I believe there is a Christ - UFO connection, where Christ is an alien, refer to Revelation 19 on this, where Christ returns in the future leading a fleet of UFOs. IN AUGUST 1999 WHEN PUTIN FIRST ROSE TO POWER IN RUSSIA, THERE WAS A RARE GRAND CROSS ASTROLOGY PATTERN OF PLANETS IN A CROSS SHAPE, AND A TOTAL SOLAR ECLIPSE OVER EUROPE, INDICATING THAT PUTIN IS THE EVIL ANTICHRIST OF REVELATION 13 WHOSE NUMBER IS 666. Putin is attempting to destroy NATO and take over the world. Do not underestimate Putin - Putin has hypnosis mind control powers he can use to control people, hypnotizing them by staring at them, his eyes are said to be intense and hypnotizing. Others who could hypnotize people with their gaze were Rasputin and Hitler. September 2017. The Cassini Saturn space probe crashed into Saturn/Satan. Cassini's connection to Putin: Putin first rose to power on August 9 1999. Also then, the day of the Astrology Grand Cross in the sky: August 18 1999, was the day after Cassini, carrying Plutonium, passed close to earth. And 1999 has 666 upside-down, 666 being the number of the Antichrist in Revelation 13. This August 1999 Grand Cross, which is one of the most amazing astrological alignments ever seen in history, consisted of: the Sun, Venus, and Mercury in the sign of Leo, Mars and the Moon in Scorpio with Pluto close by in Sagittarius, Saturn and Jupiter in Taurus, and Neptune and Uranus in Aquarius. If Scorpio is considered to be the Eagle, and Aquarius the man, then we have the four beasts seen in Revelation 4 that sit at the throne in heaven, that have the faces of an eagle, a man, a lion, and a calf. This seems to indicate an important time for mankind; I think it may also relate to the rise to power of the Antichrist in year 2000 as Russian President Putin, especially since there was a cross pattern. Also, note that August 13, 1999 was Friday the 13th, said to be an unlucky day. Also note that August 9, 1999, was the 30th anniversary of the Charles Manson group's murder of Sharon Tate and others in Los Angeles, significant because of the Charles Manson group's Satanic-like cult. Also: August 13 1999 was the significant future date on the Aztec Sun calendar from Mexico of 500 years ago, and August 13 1999 was predicted by the Aztecs to be an important day of change for mankind, that would change the world, as described in the book: "Day of Destiny, Where will you be on August 13 1999? ", by John Mini, published 1998 by Trans-Hyperborean Institute of Science. Considering again Cassini going to Saturn: as for the planet Saturn, possibly Saturn represents "Satan"-- the Antichrist is said to be a Satanic imitation of Christ, actually the son of Satan. So the Cassini probe journey to Saturn actually may be the journey of mankind to "Satan". Also note that in Greek, where each letter is also a number, "Titan" totals 666, another indication of the Cassini landing on Titan being connected with the Antichrist. Note that Titan (representing the Antichrist?) revolves around Saturn/Satan. I have updated the calendar page and other pages. Why do I say that Putin is the Antichrist of Book of Revelation chapter 13? There are many reasons why I am sure that Putin is the evil one who will bring about World War 3, that I discuss on the pages on Putin and Russia. The biggest reason is that when Putin first rose to power there was an unusual Astrology pattern that also relates to a Nostradamus prophecy about the Antichrist. Let us consider the Grand Cross Astrology pattern of August 1999. On August 18, 1999, there was an unusual alignment of planets in a Grand Cross shape, possibly the most unusual Astrological alignment seen in the last two thousand years. And one week before, on August 11, 1999, there was a solar eclipse seen over Europe. The Grand Cross, which is one of the most amazing astrological alignments ever seen in history, consisted of: the Sun, Venus, and Mercury in the sign of Leo, Mars and the Moon in Scorpio with Pluto close by in Sagittarius, Saturn and Jupiter in Taurus, and Neptune and Uranus in Aquarius. The cross is a bent cross, relating it to the Antichrist, as the true cross relates to Christ. Mars rules triumphantly, before and after"
Concerning this prophecy by Nostradamus, it is interesting that the solar eclipse passed over France on August 11,1999, and on August 17, 1999 the Cassini spacecraft with its nuclear fuel passed within a thousand miles of earth's surface, within a day of the Grand Cross pattern. I think the significance of Cassini passing by earth within a day of the Grand Cross pattern is that Cassini may be a hologram, a symbolic parallel event, related to the rise to power of the Antichrist in Russia as Vladimir Putin, President of Russia. Note that the Cassini spacecraft reached Saturn in July 2004, and landed a probe on Saturn's moon Titan in Jan. 2005. "Titan" in Greek totals 666 (the number of the Antichrist), where in Greek each letter is also a number, and Greek is the language of the Book of Revelation and the New Testament. Note that Russian President Putin began his rise to power in Russia in August 1999, at the time of the Grand Cross Astrology pattern and solar eclipse over Europe, becoming Prime Minister for Yeltsin (second-in-command in Russia) on August 9, 1999. On December 31, 1999, Putin became Russia's President. And Mars is war - war will occur when Putin is in power. "King of the Mongols" - that Putin will be a tyrant rising to power in Asia. Charles Manson has been in the news in recent years, he is an alleged mass murderer in prison for life in California. This may be significant in our discussion of the Antichrist Putin. Note that the Antichrist in Revelation 13 has the number of man, and 666. Man-son. And note that the Manson murders of Sharon Tate and others in LA California was on August 9, 1969. That was exactly 30 years before the Antichrist Putin became Prime Minister of Russia on August 9 1999, at the time of an August 11 1999 solar eclipse over Europe, and the August 18 1999 Grand Cross Astrology pattern of planets in a cross shape. And actress Sharon Tate who was murdered was the wife of Roman Polanski, who in 1968 had made a movie called "Rosemary's Baby" about the child of Satan. Also note that Charles Manson's cult lived in Death Valley in California, and Charles Manson included Book of Revelation prophecies in twisted form in his twisted philosophy. April 25, 2014. The Prime Minister of Ukraine said he thinks Putin wants to start World War 3. I think he is correct, but I think Putin will not start World War 3 with a missile attack on the West until 2020-2021. A reason for invading earth may be that the aliens are concerned about global warming and earth's environment, refer to Revelation 11:18 "shouldest destroy them which destroy the earth". 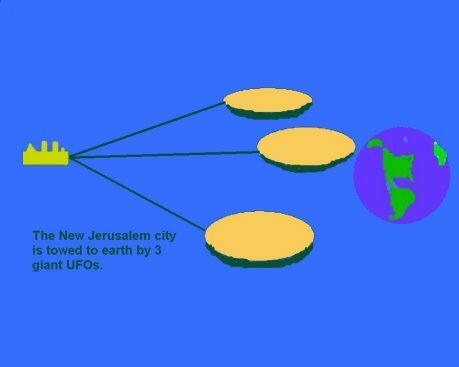 And the New Jerusalem of Revelation 21 could be a giant alien city that comes down to earth after the alien invasion. Revelation 21 and 22 seem to be describing the reorganizing of earth by aliens. So Christ would be lead alien. And Nostradamus prophecies also prophesied alien invasion of earth and human genetics DNA modified for immortality, see this page. PSALM 121 MAY INDICATE THAT 2021 IS THE YEAR OF ALIEN INVASION! 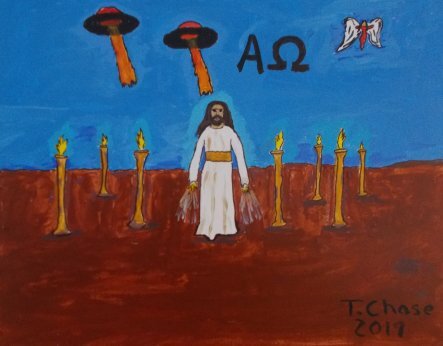 (Paintings by T. Chase - Christ returns on a UFO as described in Revelation 19. 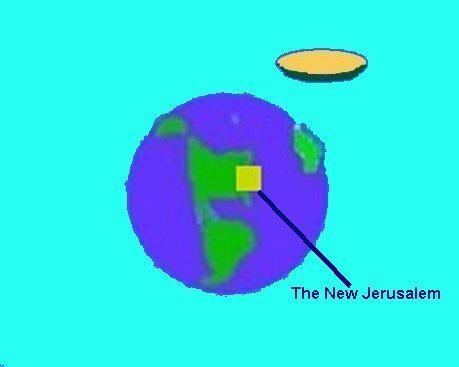 And the New Jerusalem is brought down to earth.). 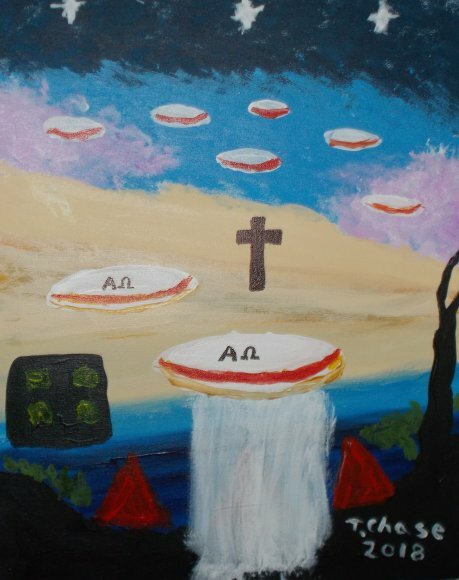 (The New Jerusalem is brought to earth by UFOs). A video on Nostradamus prophecies and predictions for 2019 - 2020. Comet ISON seen in November 2013 was discovered in Russia (so connect it to the rise of the Antichrist Putin) in September 2012 by a telescope at Kislovodsk Russia, coordinates 43.9 N 42.9 S. It is green in color so could it be the 4th horseman of the apocalypse Death Zika, Bird Flu epidemic or SARS virus epidemic? So a shift of 151 degrees from the Lordsburg midpoint, refer to this page on geographic coordinates for an explanation. 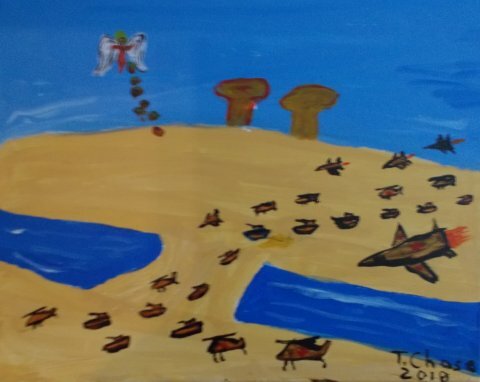 Corresponding to 151 degrees, Revelation 15:1 "And I saw another sign in heaven, great and marvelous, seven angels having the seven last plagues...". So could these plagues described in Revelation 16 (death in the sea, solar flares, rivers became blood, war, etc.) hit soon starting in 2019 - 2020? This web site has my vision, my visions and prophecies of the future. I relate the geographic coordinates of the point of discovery of Comet Ison to the discovery locations of Comet Hale-Bopp, with a shift of 151 degrees, relate that to Revelation 15:1, which talks about 7 angels with 7 plagues which could be a comet. This website has much on conspiracy theory, conspiracies, conspiracy theories. A serpent is seen on the shore." and there is a terrible slaughter of people and animals. - Jerusalem would be ruled by the Ottoman Turks for 8 Jubilees or 8x50=400 years. This was 1517-1917. - In the 9th Jubilee (50 years) Israel would be a "no man's land". It was ruled by the British after 1917. - Jerusalem would come under Jewish rule at the end of the 9th Jubilee, and this would begin the End Times with the coming of the Messiah. This happened 50 years later on June 10 1967 with Israel conquering Jerusalem. 50 years later from June 10 1967 is June 10 2017. Will this be starting in 2017 the End Times period, which according to this prophecy will see the coming of the Messiah? And the Christian interpretation is that this will be the returned Christ, who will defeat the Antichrist at the Battle of Armageddon, which I think is World War 3 started by Putin. April 2019. 66 years, 6 months, (666) since potential Antichrist Putin was born in 1952, could relate to the Antichrist Putin and the Battle of Armageddon. June 14 2019. 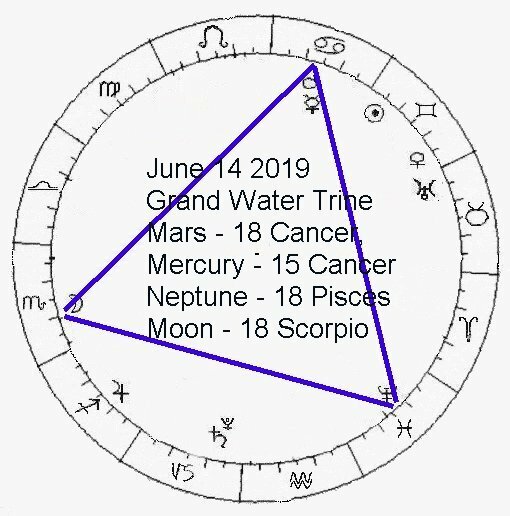 Unusual Astrology pattern - June 14 2009, Grand Water Trine. Mars - 18 Cancer, Neptune - 18 Pisces, Moon - 18 Scorpio. Mercury also at 15 Cancer. Note that 18=6+6+6. Also: on July 2, in Timbuktu Mali in Africa, there was opened the main gate at an ancient mosque, that it was prophesied would only be opened at the time of the End of the World. And see the calendar pages on how a triangle pattern appeared on the sun on March 14 2012 when there was a 999 (666 upside-down) grand trine triangle astrology pattern, after the March 4 election of Putin the Antichrist in Russia. Does Putin the Antichrist 666 have power over the sun? Revelation 13:13 (King James version) on the Antichrist: "And he doeth great wonders, so that he maketh fire come down from heaven on the earth in the sight of men." Solar flares? Putin was reelected as Russian President on March 4 2012, and 2 days later March 6 the sun sent a solar flare towards earth. See this page on Putin's connection to Ra the Egyptian sun deity. And the Cold War appears to be returning, with Putin returned as Russian President, a Russian General having made threats in May 2012 of a nuclear strike against NATO ABM Anti Ballistic Missile sites being deployed in Eastern Europe. Revelation 13:13 (King James version): "And he doeth great wonders, so that he maketh fire come down from heaven on the earth in the sight of men." So could Revelation 13:13 be about Putin (or North Korea) launching a nuclear missile strike on Europe or the U.S., starting World War 3 in the future? Or could this be about Putin causing giant solar flares to hit the earth? Feb. 13 2012. 5.6 quake, Northern California coast. Feb. 15 2012. 6.0 quake off the coast of Oregon, in the U.S.. This is a major concern, because a giant magnitude 8 quake (see this page) could occur underwater off the coast of the Pacific Northwest U.S., causing a giant tidal wave that could go miles inland in the U.S. - Oregon, Washington state, and Northern California, and also hit Japan. This 6.0 quake off Oregon could indicate a larger 8 or 9 quake could occur soon there, underwater off the coast on the Cascadia undersea fault line. August 24 2014. 6.0 quake in Northern California. ALSO: HAS ANYONE OUT THERE NOTICED THAT THERE HAVE BEEN A LOT OF VOLCANOES AND EARTHQUAKES THIS YEAR? WATCH OUT FOR INCREASING EARTHQUAKES AND VOLCANOES AROUND THE WORLD IN 2019 - 2020 - 2021! AND WATCH OUT FOR EVENTS IN THE WORLD, SEE THE CALENDAR PAGE ON IT! AND IN 2019 - 2020 - 2021 THERE COULD BE MORE AND LARGER QUAKES, VOLCANOES, POSSIBLE WAR, NEW EPIDEMIC! THE FOUR HORSEMEN OF THE APOCALYPSE RIDING IN 2019-2020! Note that there were a lot of earthquakes and volcanoes in 2009-2016. For example, on April 13-14 2010, Iceland Eyjafjallajokull volcano erupted again, and its volcanic ash goes over Europe over the next few days and grounded airplanes at airports across Northern Europe. There is a concern that a larger volcano Katla near it could erupt soon. Iceland has more than 100 volcanos, many could erupt soon, and volcanoes have been erupting in Indonesia and other countries in 2010-2018. This could be a beginning to major volcano eruptions in Iceland, Indonesia, and elsewhere that could cool off the earth, ground air traffic, cause no summer and severe winters. Note that 70,000 years ago the Toba supervolcano erupted in Indonesia and nearly caused the extinction of mankind then. Volcanos can be a major problem for man's survival on earth. And volcano activity in the Canary Islands off Africa could result in a giant tsunami tidal wave hitting the East Coast of the U.S. and Europe, see this page. Note: One reason why a Southern California large earthquake has not occurred is because there may be an alien UFO base off the coast of Los Angeles (LA), and the aliens may be preventing a Southern California San Andreas Fault quake which could damage their underwater base. They may be slowly releasing the earth stress to prevent a quake there. A lot of UFOs have been seen entering and leaving the deep water off the coast of L.A., so its very likely they have an underwater base there. Therefore it is unlikely there will be a major Southern California Quake in future years. Controlling earthquakes is easy for these aliens. In this site Revelation13.net, my method of prophecy combines Astrology and other New Age Schools, mythology, religion, the prophecies of Nostradamus, Bible Code in the King James Bible, Bible prophecy, and numerical analysis. In particular, the Book of Revelation of the King James Bible is discussed. This web site is huge, you can spend days reading it. The emphasis of this web site is on predicting the future for years 2019 - 2020 - 2021. There could be ominous events possibly occurring in 2019 - 2020 - 2021: quakes, volcanoes, Ebola, Zika, Bird Flu or SARS epidemic, and wars. This is a new holistic method of prophecy I have developed. Also on this web site are videos on Psychokinesis, where I demonstrate using Psychic Energy to control the weather, clouds and wind, by psychic ESP mind over matter power, telekinesis, making clouds grow or disappear and controlling the wind. I will give a detailed description of my theories in this web site. Also discussed here: economic predictions and the Stock Market, predictions of world events for this year and future years. And the election of President Barack Obama brings Hope to the world in a time of great economic crisis. I think the election of President Obama is part of a trend discussed on this page, where Hope for the world comes from the Southern Hemisphere. Note that Kenya is on the equator, where the Southern Hemisphere begins. This is related to the 1987 Southern Hemisphere Supernova, which resulted in a wave of positive change in the Southern Hemisphere, with Democracy coming to South America and positive change in South Africa. Note that Revelation 6:8 is about the Fourth Horseman, Death, so will Death ride in 2019 - 2020 as a worldwide epidemic? 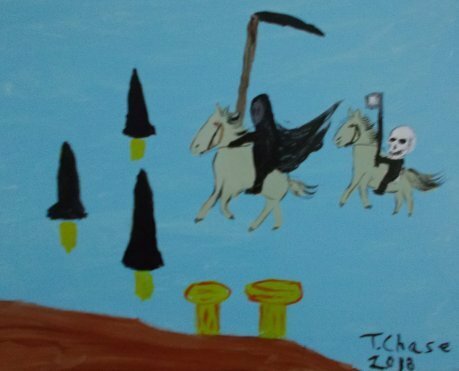 Above: my painting of the Fourth Horseman, and Hell also riding with him. Also, the Astrological events of August 1999 (a solar eclipse seen in Europe and a rare alignment of planets in a cross shape) is discussed. Possible Antichrist sighting: I think the Antichrist is the Russian President elected in March 2000, Vlad Putin, and the Red Dragon that Putin the Antichrist will be allied with is China, as well as Iran. And the planetary alignment of 5/5/2000 with the sun and planets on one side of the earth is discussed, note that Vladimir Putin was inaugurated as President of Russia 2 days later on May 7, 2000. And on November 4 2003 there was the largest solar flare ever seen, when Putin was in Rome, and on Nov. 8 there was a lunar eclipse and a grand sextile hexagon shaped astrology pattern, again indicating Putin is the Antichrist; apparently Putin visiting Rome, which is connected with the Antichrist in Bible prophecy, resulted in a tremendous Satanic force that resulted in the giant solar flare on Nov. 4 2003, see this page. And the possibility of a doomsday asteroid or comet collision with earth is discussed, note that in 2002 there were several asteroid near-misses with earth; and a King James Bible Code matrix may predict an asteroid hit in the ocean within a few years, causing a giant tidal wave. A suggestion: a great economic stimulus project would be to build an asteroid defense for earth, for a few billion $ NASA could build an asteroid defense using interceptor rockets, and this would create jobs in the U.S..
Also, on this web site, other prophet's prophecies are discussed, other Bible prophecies. And watch my videos on the subjects discussed here, including the King James version English Bible Code, prophecies of the future, Nostradamus, and other subjects. This web site used Codefinder Millennium Edition Bible Code software. Generally, on this web site astrology, new age methods, numerical analysis, religion, and mythology are combined to explain the world today, and to predict the future. Eta Carinae, the giant Southern Hemisphere star, could it become a giant supernova soon? Comet Hale-Bopp, Comet Hyakutake, and could there be another bright comet soon? Could a comet or asteroid hit earth? Could a giant solar flare scorch the earth? Foot-and-mouth disease in sheep, cattle, and pigs and England, "the slaying of the lamb"
Russia, Feet of a Bear: is Russian President Putin the Antichrist? Russian President Putin more on why he may be the Antichrist. The War against Terrorism, following the 9/11/2001 attack on the U.S.
May 5 2000 planetary alignment, did it announce the rise of the Antichrist in Russia? The Prophecies of Nostradamus, do they indicate the Antichrist is Russian President Putin? Page 1b: The future of the Muslim Dome of the Rock in Jerusalem, and will there be a new Jewish Temple on the Temple Mount? Part 1g: Russian Mole Agents in the U.S., including Anna Chapman. And was there an attempted Nuclear Missile Attack on the U.S. from a Soviet Union Submarine in March 1968. Part 1j: The New Russians Submarines and Missiles to threaten NATO and the U.S. Page 2f: Where is the missing girl Madeleine McCann? Page 6: Cold Fusion, can it generate nuclear power? Can it power Time Travel? Page 6a: String Theory, M-Theory, other dimensions, and a Unified Theory of Everything. Page 7: A Nuclear Fission reactor in Earth's Core? Part 7a: Geology: Discovery of oil wells in Israel? Page 8: Could a volcano in the Canary Islands result in a giant tidal wave hitting the U.S. and Europe? And could Yellowstone in Wyoming explode as a supervolcano? Page 8a: Could a giant magnitude 8 earthquake shake the San Andreas Fault in California, in the near future? Or a giant tidal wave hit California? Page 8b: The Magnitude 9 Earthquake and Tidal Wave off Indonesia in December 2004. Page 8c: A Giant Earthquake on the New Madrid Fault Line in the Central U.S.? Page 8f: Will Mount Rainier in Washington state erupt soon? Will the Hekla Volcano or Katla Volcano in Iceland erupt soon? Page 9a: How will the stock market and world economy do? Page 10: Ebola Disease, the deadly virus of Africa; could it cause a worldwide plague? Also, AIDS and HIV, Mad Cow Disease (BSE), Influenza (bird flu or swine flu), SARS. Page 11: Could an asteroid or comet hit earth soon ( an ocean impact, 7 pieces, 7 hits, tidal wave), causing an Extinction Level Event (ELE)? Page 12: Two Southern Hemisphere stars that I relate to prophecies: the 1987 supernova and the giant star Eta Carinae. Page 12a: Is there Life outside Earth in our Solar System - on Mars, Europa, or Titan? 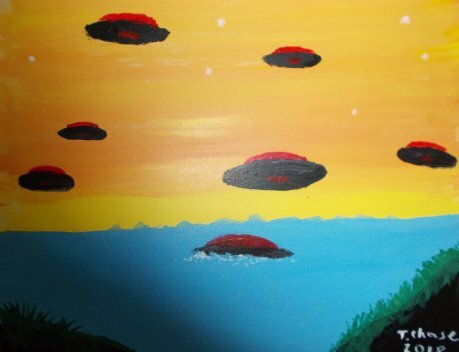 Are Flying Saucers and Aliens for real? Men in Black. 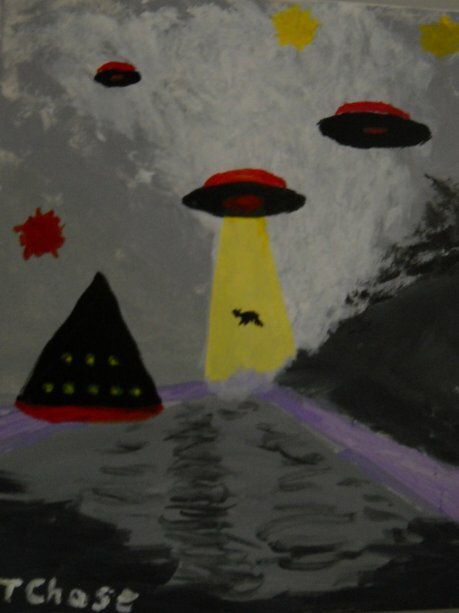 W56 UFOs and Aliens. The Nazca Lines in Peru, a sign of Alien Visitors? President Obama and Aliens. George Adamski who saw Aliens and UFOs in the 1950s. The missing Flight 370 in 2014, a possible UFO connection? Page 12b: Comet ISON in November 2013. Page 14a: John Titor and his story of time travel and prophecies. He said he was from year 2036. Page 15: The Bible Code related to "The Da Vinci Code" (the book by Dan Brown), the Knights Templar, and the Mary Magdalene mystery. 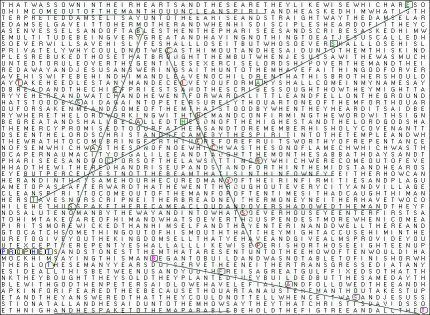 Page 15a: Crop Circles and the Bible Code, and the rise of the Antichrist. Page 16: The Voynich Manuscript; can the Bible Code decode this strange document? Page 17: Human Evolution and Neanderthal Man, and is the Human Brain a Quantum Computer? Watch my videos on subjects discussed on this web site: the King James version English Bible Code, Nostradamus prophecies, AIDS disease, John Titor the Time Traveler, Cold Fusion Nuclear Power, Bible prophecy, prophecies of the future for the next 10 years, New Age Geography, and many other subjects. Psychic Channeling from my channeling videos. Dream Log: Dreams I have had. Psychic Psychokinesis Powers of Weather Control are demonstrated in videos I made, making clouds grow and disappear and controlling the wind. (1)1998=666x3, and 1999 has 666 upside down, and 666 is the number of the Antichrist (also called The Beast) in Revelation 13, I believe these numbers are connected with his appearance in year 2000 (as Russia's President Putin), and there will be a powerful satanic influence in the world (related to Putin) in 2019 - 2020, that relates to the rise of the Antichrist Putin. Revelation is the last chapter of the Bible, and includes a series of prophecies of catastrophic events-- wars, earthquakes, diseases, economic chaos, and the arrival of the Antichrist. Angels are also mentioned in Revelation, such as an angel from the East in Revelation 7, another Angel in Revelation 10. 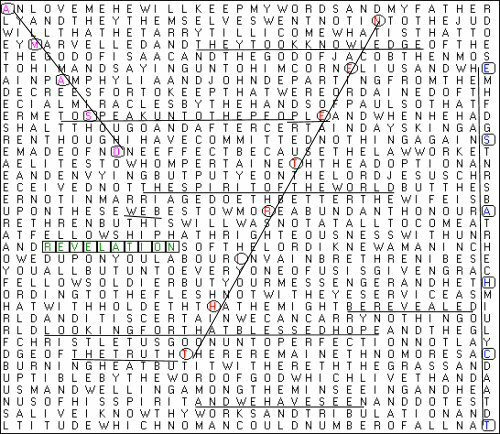 Many people believe the prophecies of the Bible are coming true now, as described in Revelation; the popularity of the excellent book "The Bible Code" by Michael Drosnin, (see this page for more discussion of it, and this page on the King James version Bible Code) indicates the interest of people in Bible prophecy. Another interesting book: "The Da Vinci Code", by Dan Brown, is about the Biblical-related mystery concerning Mary Magdalene, and the legend that she actually married Jesus Christ, and had children by him, whose descendants were kings of France, and that the blood line has been traced to present times by a secret society in Europe. See this page for relevant discussion on this subject. As described in the prophecies of Revelation, the Antichrist is the son of Satan, a Satanic imitation of Christ. The Antichrist will be assisted by the False Prophet, who is the Second Beast of Revelation 13. The False Prophet is said to work apparent miracles, including "bringing fire down from heaven". The Antichrist is described as having the mouth of a lion, feet of a bear, and gets his power from the dragon: the bear is Russia, the dragon is Red China and also Satan, and the mouth of a lion I think is Hong Kong, the former British colony that is now part of China. This indicates a Russia-Red China military alliance. A second meaning of the lion is Iran, where before the Islamic Revolution Iran had a Lion on its flag, indicating a Russia-China-Iran military alliance, with Russia helping Iran build the A-Bomb by helping it with its nuclear program, and Russia has been selling military equipment such as missles to Iran. The "mouth of a lion" could be Iran. Also, note that a Russia-China military alliance has formed in the Shanghai Cooperation Organization (SCO) which consists now of Russia, China, and 4 Central asian Countries, and which met in October 2005, and there was a Russia-China joint military exercise in 2005. Clearly the SCO was formed as an alliance against the U.S. and Western Europe. And more countries may join the SCO. The SCO may actually develop into a confederation of 10 states led by the Antichrist Putin, the red 10 horned beast of Revelation 13. Also, it is possible that Belarus may unify with Russia, so it is shown in the drawing below. "The little horn" is a name for the Antichrist from the Book of Daniel (note Putin's small size), so St. Petersburg Russia is where this little horn of the red beast has grown. 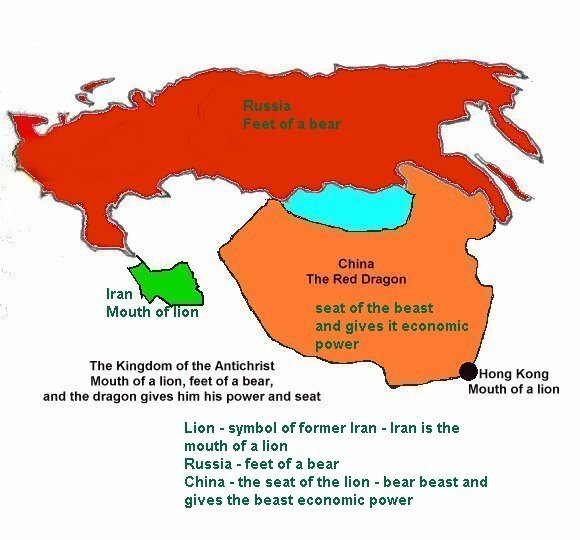 Alternative lion/bear/dragon: Russia-Iran is the bear-lion beast that sits on the dragon China, and gets its economic power from China. 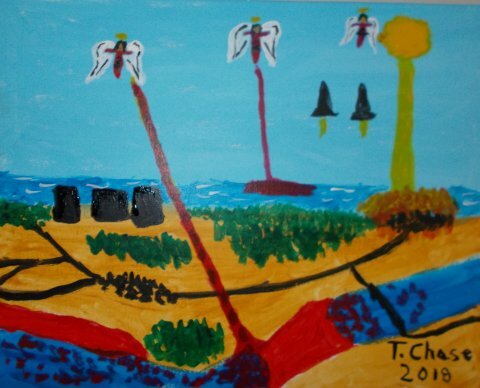 And in this painting by me from Revelation 16 are shown 3 angels who turn rivers and the sea to blood, and have the sun scorch the earth with fire. 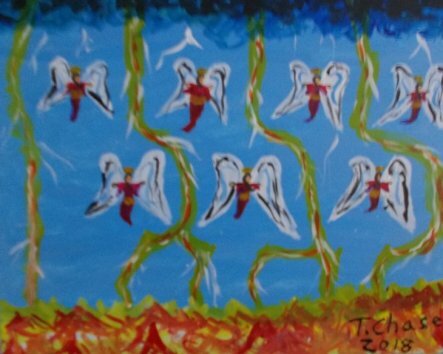 And in this painting by me, referring to Revelation 8 and 15, are shown 7 angels, who result in lightning and there is a sea of fire and glass. (2) A key sign in 1998-99 that could relate to the arrival of the Antichrist was on April 23, 1998, (and also Feb. 23, 1999) when the planet Venus approached close to Jupiter in the sky. Jupiter relates to the Antichrist, because Jupiter and Thor (the Scandinavian equivalent) are said to control lightning and thunder, and the Antichrist is said to bring "fire down from heaven", which sounds like lightning. Venus having a close conjunction to Jupiter could mean Jupiter is "lit" by the close approach of Venus. There was a similar but much closer approach of Venus to Jupiter on June 17, 2 B.C., near the time of birth of Christ; the 2 planets actually appeared to merge in the sky. This could have accounted for the Star of Bethlehem legend; the 3 wise men were Astrologers, and such an unusual planetary conjunction would have had great significance for them. So, these similar conjunctions in 1998 and 1999, and on February 1 2008 a close approach of Venus and Jupiter to within .5 degree, could mean the Antichrist rose to power in 2000 and I think he is Russian President Putin. And note that on May 17, 2000 Venus and Jupiter also had a very close conjunction, only 4' apart, but were too close to the morning sun to be seen. And note that on Nov. 4, 2004, Venus passed within .6 degree of Jupiter. Also on July 1 2015 there was a close conjunction in the sky of Venus and Jupiter, and on on October 28 2015 a close conjunction of Venus, Jupiter, and Mars. Also of interest was the 5/5/2000 grouping of the planets on one side of the earth: the 5/5/2000 alignment may be just another sign of the rise of the Antichrist, note that President Putin was inaugurated as President of Russia 2 days later on May 7, 2000. Possibly the Antichrist was elected as Russian President Putin in the spring of 2000. See the Russia section for a discussion of this and some interesting facts on President Vladimir Putin. Also indicating Putin is the Antichrist: Putin visited Rome on November 4 2003, on the day there was the largest solar eruption from the sun in history. And November 8 2003, during a lunar eclipse, there was a hexagon astrology pattern (6 sides, as in 666) that I relate to the Antichrist Putin, also on the Putin page. As I said, the Antichrist will appear to be a good man, and will appear to be the saviour of mankind. "Satan comes as an angel of light". Osama bin Laden I think is the Angel of the Bottomless pit, or The Destroyer, mentioned in Revelation 9:11, a demon or unclean spirit from the depths of Hell, who creates this world crisis we are seeing now that will result in the rise to power of the Antichrist, who is the Satanic Christ, past Russian President Putin. Putin has been praised around the world for bringing stability and economic prosperity to Russia, which under Yeltsin had been headed for anarchy and economic chaos. And in the future Putin may have a key role in building a space defense against asteroids, since an asteroid could be headed for earth; this was announced in December 2009, that Russia may intercept an asteroid that could hit earth in the future. Another way Putin will come to world power as the Antichrist is by controlling the world's Natural Gas reserves, Russia having the world's largest Natural Gas reserves. It appears that Putin controlling Natural Gas reserves and prices is a key way that he can control the world economy. But I think an event frequently discussed in Biblical Prophecy called "The Rapture" will not occur, because this is a misinterpretation of Biblical prophecy by innumerable writers and preachers. Supposedly "The Rapture" would occur during or just before the rule of the Antichrist, and would be an instantaneous disappearance of millions of Christians around the world, leaving other people behind, and it is described as a joyous event where they will all go to heaven together. I think this will not happen, because these writers and preachers are not correctly interpreting Bible prophecy. I think we are in the End Times, but the Rapture will not occur. Or it could be that The Rapture is caused by a CERN LHC created Black Hole eating earth and all the people on it. In 2015 the LHC was turned on again with greatly increased power, making creation of a Black Hole more likely sometime in the future. 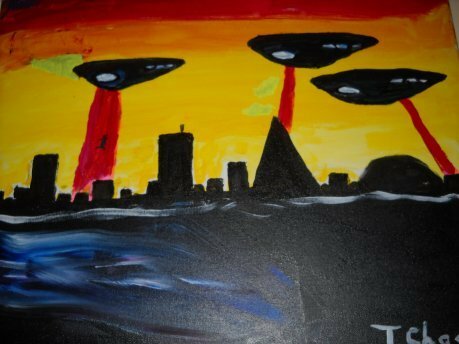 Or The Rapture could be related to aliens, possibly a mass alien abduction of millions of people, possibly related to an alien invasion of earth that could occur within a few years, see the calendar page on it. See this video on the CERN LHC and a Nostradamus prophecy. And concerning the planet Pluto: in Nov. 2005 there was a very significant astronomy event: it was announced that two more moons of Pluto have been discovered, the previous moon Charon having been discovered in 1978, and is 12024 miles from Pluto, and 752 miles wide, and orbits Pluto in 6.4 days. Pluto being one of the Four Horsemen of the Apocalypse, Death, as explained on this page, this is very significant. This is another sign that Death will be riding soon. One of the newly discovered moons is 30-80 miles wide, and 30,000 miles from Pluto, and orbits Pluto every 25.5 days. The other new moon is 35-100 miles wide, and 40,000 miles from Pluto, and orbits Pluto every 38 days. Note that on July 14 2015 the NASA New Horizons spacecraft reached Pluto, so will the Fourth Horseman Death ride in 2019 - 2020? June 6, 2006. 6-6-06, 666 being the number of the Antichrist. Note that this was 40 years after 6-6-66 (June 6, 1966), 40 years being associated in the Bible with a period of testing. Note that AIDS was first announced on June 5, 1981, when it was first detected in five men in Los Angeles. So June 5 2006 was the 25th anniversary of AIDS, 1 day before 6-6-06. Could it be that AIDS is one form of the Fourth Horseman of the Apocalypse, Death? And Putin the Antichrist hosted the G-8 summit of world industrial powers in Russia in July 2006. July 7, 2007. 7/7/07 (777). See the page on Greek, where I show that "777" in Greek corresponds to the word "Cross", which is interesting since "666" is the number of the Antichrist in Revelation 13, and "888" corresponds to "Jesus" in Greek. August 8, 2008. 8/8/08 (888). Russia Georgia war. Russia invades Georgia. This shows Putin is again head of Russia, and on his way to becoming Antichrist. Sept. 9, 2009. 9-9-09. 999, 666 upside-down. Possible significance: the CERN LHC collider and possible Doomsday Machine was turned on again, later in 2009 in November, after initially starting up in Sept. 2008, but only running a few days before shutting down for major repairs. See this page on it. Nov. 11, 2011. 11-11-11. Interesting date because 11:11 was a New Age related number. Dec. 12, 2012. Near the Mayan calendar date December 21 2012. So, the pattern is: the Antichrist in June 2006, the Cross in 2007, war in 10-10-10, change in 2011, and world transformation continues on 12-12-12 on the Mayan Calendar date. See the calendar page for more explanation on this. (4) Economics. I would keep a close eye on the Stock Market and the world economy in 2019 - 2020, there could be economic problems in Europe, Asia, and generally in the world economy, but I think the U.S. will do better than most of the world. December 24 2014 - June 15 2015, September 19 2015 - December 20 2017. Saturn is in Sagittarius. A severe economic recession? The third horseman economic chaos rides? See this page for an explanation of why Saturn in Sagittarius relates to economic chaos, setting the third horseman economic chaos riding. Also, investments and business dealings with Russia should be avoided. Europe and in particular Germany, which are increasing economic and political connections with Russia, I think are making a big mistake that will be regretted when Putin turns against Europe in the future. Putin is evil, but Europe will be fooled by him. Watch out for a mother bear (Russia) that has lost its cubs (Russia's empire), it can be an angry mother bear. I think Russia's economy will actually grow under Putin, but I think Russia will turn very dangerous and angry towards the West within a few years. I believe that 4 of the Planets correspond to the Four Horsemen of the Apocalypse in Revelation; Jupiter is the Antichrist, Mars is War, Saturn is Economic Depression, and Pluto is Death (and Hell rides with Death, Pluto has a single moon Charon, which like Pluto has a mythology connected with the Land of the Dead.) Saturn I would relate to economic depression, because in Greek / Roman / Etruscan mythology, Saturn was associated with agriculture as well as weights and measures and coins. So, there could be worsening world economic problems in 2019 - 2020. So the third horseman, economic problems, could ride (in Asia, Europe, Latin America, and much of the rest of the world, the U.S. I think will not do too badly, the economy dropping some). (5) War. War could be a worsening problem in 2019 - 2020. Russia could invade Ukraine and other former Soviet Union countries to incorporate into Russia. Russia has threatened a missile strike on NATO ABM sites in Eastern Europe, and North Korea has threatened to launch a missile strike on the U.S.. On May 4 2012, a Russian miltary leader made a threat that Russia may launch a nuclear missile attack on U.S. Antiballistic Missile ABM Systems being deployed as a missile defense in Europe. Notice that this was said as Putin is coming into office again as Russian President. This shows what a scary psycho Putin is, threatening nuclear war. So Putin could start a nuclear war around 2020-2021. Also watch out for a major war (that could be an India - Pakistan war, or a war in the Middle East, or Iran, Syria, Iraq and ISIS terrorists, or North Korea launching missiles). There is also concern over the Second Horseman War riding in 2019-2020 with Putin. Or a war in the Middle East resulting from revolutions in countries in North Africa and the Middle East, there seems to be a spreading wave of revolution there, who knows where it will lead. I just wonder if the revolutions in countries in the Middle East could bring them closer to Russia and Putin the Antichrist. Perhaps this will lead to the Middle East War described in Ezekiel and also Revelation 16 as Armageddon, that it could be an alliance of Middle East and North Africa countries that will form a military alliance with Russia led by the Antichrist Putin. What Middle Eastern countries will next see revolution? Where will these revolutions lead? It could work out well, with peaceful democracies in these countries. On the other hand, the French Revolution resulted in a bloodbath in France, and a monstrous dictator Napoleon who resulted in war across Europe. And the Russian Revolution resulted in the Soviet Union, and millions murdered by Stalin. So revolutions can work out well like the American Revolution did, but sometimes they don't. War in the Middle East could result from these changes, the Second Horseman of the Apocalypse War riding in 2019-2020. And if political unrest comes to Pakistan, with all its nuclear weapons, that could be a major concern. Also watch out for: North Korea attacking South Korea, or war in the Middle East. (6) The Cassini spacecraft passed by earth on August 17, 1999, on the same day as a Grand Cross Astrology pattern, the most unusual Astrology pattern of the last 2000 years. The planets aligned in a cross shape. And that was a week after a solar eclipse over Europe. Note that Vladimir Putin became Prime Minister in Russia in August 1999, this Grand Cross and eclipse may relate to Putin's rise to power as the Antichrist, and the Cassini probe to Saturn/Satan may be a holographic parallel to Putin's rise to becoming Antichrist. Since the Cassini spacecraft landed a probe on Titan in Jan. 2005, this could be related to the rise of the Antichrist (Putin), note that Titan in Greek (the language of the Book of Revelation) totals 666, see this page on Greek. (7) Diseases. Disease epidemics could be a worsening problem in 2019 - 2020, including Bird Flu or H3N2 Flu Influenza, and SARS could return -- I think these are diseases that could cause great problems over the next 5 years. And antibiotic resistant bacteria infections. Watch out for worsening worldwide disease epidemics in 2019-2020, including Ebola and Flu and Zika Virus. And this disease epidemic could be Ebola, or swine flu, or Flu strain H3N2 Fujian, which is a severe strain that began as an outbreak in 2003, or it could more likely be bird flu type H5N1 causing a severe epidemic in birds - chickens, ducks, etc.- but that can spread to humans. H3N2 Fujian began in Fujian Province in China, (associating it with the Red Dragon, Red China, in Revelation 12), and bird flu began in Korea in Dec. 2003, but previously there was a 1997 outbreak in Hong Kong, associating it with the dragon. The concern is that bird flu is very deadly to people, and if it mutates to spread from person to person then it could cause a deadly worldwide pandemic in 2018 - 2020. And swine flu began speading worldwide from Mexico in April 2009, see the calendar page and Flu page on it. See the King James Bible Code matrices on diseases, including the possibility of an airborne Ebola outbreak, and a deadly Swine Flu mutation. (8) The Southern Cross effect. In 1987 there was a Supernova in the Southern Hemisphere sky, "igniting" astrologically the positive influence of a nearby Constellation, the Southern Cross. This began a positive sequence of events in the Southern Hemisphere, with Democracy coming to South America after that, and positive change to South Africa. I think this trend will generally continue through year 2019 - 2020, because the Southern Hemisphere supernova is brightening again because of a collision of gases in space, it will be like a new Star of Bethlehem. Hope will come from the Southern Hemisphere. This is related to the 1987 Southern Hemisphere Supernova, which resulted in a wave of positive change in the Southern Hemisphere, with Democracy coming to South America and positive change in South Africa. But the Northern Hemisphere could see problems, related to the economy, war, natural disasters, diseases; the Four Horsemen riding in 2017 - 2019. In 1993 there was a Supernova in the Northern Hemisphere Great Bear Constellation, and since Draco the Dragon is a constellation close to it, and the Dragon is Satan in Biblical symbolism, this began a negative influence over the Northern Hemisphere, which will likely continue. So the Northern Hemisphere will likely see problems with earthquakes, volcanoes, diseases, wars, weather changes, economic problems, the rise of the Antichrist in Russia, terrorist attacks. Also, a comet or asteroid could hit the earth possibly in 2019 - 2020. After this, a new Messiah will come, as indicated by this new Star of Bethlehem, the Southern Hemisphere supernova which will then be visible in the sky again. He will likely bring a new source of energy, possibly Cold Fusion. See the 666 day intervals section for more on this timetable, and also there is another brightening star, Eta Carinae, near the Southern Cross. See this page on King James Bible Code matrices which may predict Eta Carinae could explode into a bright (daytime) Southern Hemisphere supernova in 2019-2021, and also on matrices on the 1987 supernova, which is brightening again. 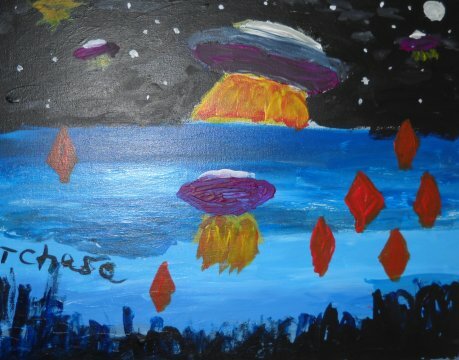 (9)Comets. We have seen bright comets in 1996 and 1997, and I think there could be another bright comet in 2018-2019. As Comet Hale-Bopp peaked in April 1997, there was a fire in April 1997 in the Cathedral holding the Shroud of Turin in Italy, but the Shroud fortunately escaped damage, due to the bravery of a Turin firefighter. The Shroud of Turin is believed by many Christians to be the burial cloth of Christ. Recent carbon tests seemed to indicate it was a fake, but those tests are considered by many people to be invalid because: (1) there was bacteria growth on the cloth that invalidated the measurements (2) a previous fire in 1532 resulted in carbon deposits on the cloth that invalidated the recent carbon tests. So, the cloth could be the real burial cloth of Christ, bearing his image on it. What is interesting, is that at the time of the previous shroud fire, there were three bright comets in 3 years, in 1531-1533. And at that time, there was the greatest schism in the history of Christianity, with the Protestant Reformation of Martin Luther. The shroud was slightly damaged, but repaired, then. Maybe the three comets of 1531-1533 represented the Holy Trinity: the Father, the Son, and the Holy Ghost. So, that is why I would not be surpised if there is a third bright comet in 2019 - 2021, but this time the comets could represent the Unholy Trinity of Revelation: satan, the Antichrist, and the False Prophet. I think the message here is that, near the midpoint between these two locations, is the town of Lordsburg, New Mexico, a name with a Biblical message. One way to consider numbers, in a religious sense, is to convert them to Biblical passage numbers. The midpoint is at 108.85 W, and if you consider Biblical Psalm passage 108:4,5 you have (King James Version): "For thy mercy is great above the heavens, and thy truth reacheth unto the clouds. Be thou exalted, O God, above the heavens: and thy glory above all the earth." So this Bible passage fits a comet, certainly. If you consider the 2 states of discovery, Arizona has a New Age connection, since Sedonna Arizona is this country's New Age center. And Arizona's Feb. 14 birthday makes it an Aquarius, the sign with a New Age connection. New Mexico, however, is Capricorn. I think that that Arizona may represent the New Age movement, while New Mexico represents traditional Christianity; these may be the two tails (Blue and White) of comet hale-bopp. Both the New Age movement and Chrisitianity have Millenial Movements. And the twin discoverers-- note that one of the beliefs in some early Christian writings was that Jesus had a twin brother, Thomas, who supposedly ended up in India, giving him sort of a New Age connection. This, I think, is the message of Comet Hale-Bopp. If there is a third bright comet in year 2019-2021, I would not be surprised if it is red in color. (10) Europe, Russia, and the Muslim world. Watch out for Russia, an increasingly negative influence could arise there. Not the type of democracy we see in the West. This relates to the Confederation of Independent States being originally a Confederation of 10 states, although I think it is more now. There is a red 10-horned beast in Revelation, that is a nasty creature. It is explained in Revelation that this is a Confederation of 10 states. With the color red (actually scarlet, a dark red), this certainly must be Russia and the Commonwealth of Independent States. With Putin in power now in Russia, he could turn Russia into a Hitler-style dictatorship, with Putin becoming a total control type of dictator and stomping on freedom of the press. 17:3 "...and I saw a woman sit upon a scarlet coloured beast, full of names of blasphemy, having seven heads and ten horns." 17:12 "And the ten horns which thou sawest are ten kings, which have received no kingdom as yet; but receive power as kings one hour with the beast." 17:16 "And the ten horns which thou sawest upon the beast, these shall hate the (woman), and shall make her desolate and naked, and shall eat her flesh, and burn her with fire." The 10 horned beast may be Russia and the C.I.S..
Also, note that the woman is holding a cup full of abominations and filthiness - the cup could be the CERN LHC particle accelerator, which is circular in shape, and the abominations could be the strange and dangerous particles the LHC creates, including Black Holes and Strangelets that could destroy earth. Note that the CERN LHC had a large increase in power in 2015, making creation of a black hole more likely. And on May 4 2012, a Russian miltary leader made a threat that Russia may launch a nuclear missile attack on U.S. Antiballistic Missile ABM Systems being deployed as a missile defense in Europe. Notice that this was said as Putin is coming into office again as Russian President. This shows what a scary psycho Putin is, threatening nuclear war. So a Russian military strike on Europe is a possibility in the future (or a North Korea missile strike on the U.S.). (11) The Two Witnesses. The Two Witnesses are two prophets who will appear during the end times events. They give prophecies seen over the internet and TV around the world. 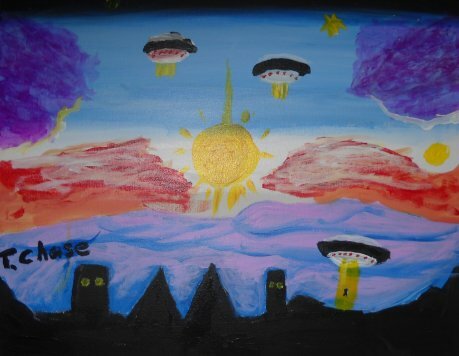 The beast kills them, but after three days they are resurrected and rise up into a cloud, which I think is a UFO. People are terrified when this happens. "11:3 And I will give power unto my two witnesses, and they shall prophesy a thousand two hundred and threescore days, clothed in sackcloth. 6 These have power to shut heaven, that it rain not in the days of their prophecy: and have power over waters to turn them to blood, and to smite the earth with all plagues, as often as they will." So watch out for two mysterious prophets who may appear by 2019-2022. See this page for Bible Code matrices on the Two Witnesses which may indicate at least one of them is from the U.S.. 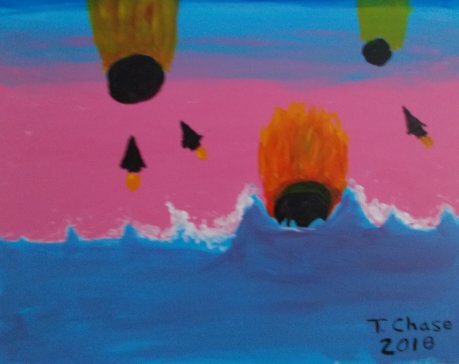 The Two Witnesses: my painting shows the 2 witnesses, then a dragon sent by the beast kills them, then they are resurrected and rise into a UFO, which is what the cloud may be that they rise up into. "10:3 And cried with a loud voice, as when a lion roareth: and when he had cried, seven thunders uttered their voices. 4 And when the seven thunders had uttered their voices, I was about to write: and I heard a voice from heaven saying unto me, Seal up those things which the seven thunders uttered, and write them not." (13) Earthquakes and Tidal waves. There could be steadily increasing earthquakes and volcanoes in 2019 - 2020. Especially after the CERN LHC was turned on again at higher power in 2015. There is also a volcano in the Canary Islands off Africa that could collapse in a few years, producing a giant tidal wave that could hit the coasts of Africa, Spain and Portugal, the U.S. East Coast, and the Carribean; see this page on King James Bible Code matrices on it. Another place there could be a giant tidal wave is from an undersea earthquake fault off the Northwest U.S., that could have a magnitude 9 earthquake causing a mega tsunami hitting Northern California, Oregon, Washington State, British Columbia, Alaska, Hawaii, and Japan. In June 2005 there were Northern California earthquakes near that under water fault zone, off Northern California and Oregon and Washington State, that brings up the possibility of a giant tidal wave occurring there, or the San Andreas fault could slip in Southern California or Northern California, hitting hard Southern California and Los Angeles or San Francisco. I will consider here three diseases that are a threat to mankind: AIDS, Ebola , and Influenza. The virus that causes AIDS, HIV, was discovered in 1983, so we will associate AIDS with the number 83. The galaxy M83 is in the constellation Hydra, which was a multi-headed serpent in mythology that kept growing a new head, each time a head was cut off. This sounds like AIDS, which keeps mutating to allow it to get around any treatment or vaccine. The Hydra was defeated by Hercules, by his nephew Iolaus burning each of the mortal heads as Hercules cut them off, and burying the immortal head under a stone. I wonder if this mythology story could somehow be a clue on how to treat AIDS? Note that the AIDS virus has 9213=111x83 bits of genetic information, so again we see the number 83 again. Ebola, a lethal disease of Africa that kills in two weeks of infection, had its virus discovered in 1976, so if we associate galaxy M76 with it, we are near the constellation Andromeda. Remember the movie "Andromeda Strain" about a lethal disease that threatened humanity? That could be Ebola if it mutates to an airborne form. Influenza was discovered in 1933. Galaxy M33 is in the constellation Triangulum. That may imply we should look for a triangle. The numbers 33, 76, and 83 do form a right (90 degree) triangle with an angle of 66 degrees. Since 666 is the number of the antichrist, this may imply that these three diseases will threaten humanity when he appears. In fact, ebola virus frequently twists itself into a shape that looks like a "6". These diseases may also relate to three animals used to describe the Antichrist: he is like a leopard, has the mouth of a lion, and the feet of a bear. Maybe Ebola corresponds to the leopard, with its great speed; Ebola kills in two weeks of infection. Influenza could be the lion; it causes coughing like a lion's roar. And AIDS could be the bear; bears hibernate, like AIDS can do in people, until it wakes up and kills them. Mad Cow Disease (BSE) infecting people's brains was announced in March 1996 in England as the Comet Hyakutake passed by the constellation (I mean constellation, not astrological sign) Virgo the Virgin. I think that virgo the Virgin represents Isis, the Egyptian Goddess portrayed with cow's horns, giving us a "cow" connection. And Virgo may also represent Europa, representing Europe, who rides a bull, again giving us a "cow" connection. And Europa on a bull sounds like the woman in revelation 17 named "Babylon" who rides the beast of the antichrist (which may be Russia), I think the woman is Europe. "18:2 And he cried mightily with a strong voice, saying, Babylon the great is fallen, is fallen, and is become the habitation of devils, and the hold of every foul spirit, and a cage of every unclean and hateful bird." Note that TB is spread by poor sanitation and hygiene, that we can relate to the"unclean" in the passage above; and Babylon was in Iraq. And galaxy M82 is in the Great Bear constellation Ursa Major, that we can relate to Revelation 13 where the Antichrist has the mouth of a lion, feet of a bear. And the bear is the symbol of Russia, where the Antichrist Putin is in power. Also, concerning the TB bacteria discovery in 1882, see this page on how a cycle of events began in 1883. This suggests that these diseases will cause worldwide epidemics as the Beast rises to power, and the Fourth Horseman Death rides - including Zika virus. Also, Smallpox could spread, as part of the Fourth Horseman. "Yea, though I walk through the valley of the shadow of death, I will fear no evil: for thou art with me"
So this relates to this disease being the shadow of death. Also note that Hong Kong is near Guangdong Province in China, and Hong Kong is a former English colony: this may relate to the "mouth of a lion" of the Red Dragon Red China, the lion I related above to Influenza. Also note that on this site I relate the lion of the Antichrist to Iraq, the lion being a symbol of Babylon, the ancient empire that was located in Iraq. So the war in Iraq in March 2003 may relate holographically to this "lion" disease SARS appearing then. This disease of SARS may be symbolic of the disease of Saddam Hussein that has existed in Iraq. Also, since SARS had its virus discovered in March 2003, then we can relate it to Galaxy M23, which is in the Constellation Sagittarius, Sagittarius being the half-man half-horse archer. This again would relate it to the Antichrist (who I think is Putin), since in Revelation 6:2 the Antichrist is a man on horseback with a bow and arrow. So SARS may indicate the rise of the Antichrist, the Satanic imitation of Christ, who is Vladimir Putin, to world prominence. And SARS coming out of China: the Antichrist gets his power from the dragon, indicating Putin will have an alliance with Red China, the Red Dragon. 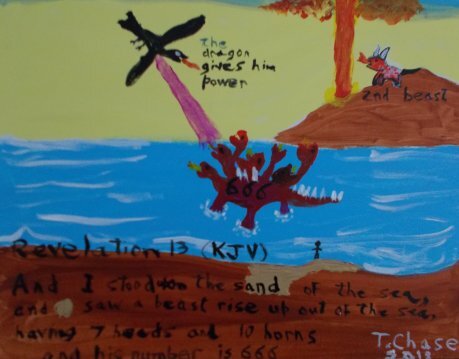 Also, corresponding to 23 for SARS (since SARS was discovered in 2003, and started near 23 North in China)would be Revelation 12:3 where the red dragon is seen in heaven. MERS is related to SARS, and MERS was causing an outbreak in South Korea in June 2015. In 1918, world flu epidemic, as the Red Beast formed in Russia with the Russian Revolution (the beginning of the Antichrist's Evil Empire in Russia). And a bird flu virus infecting chickens and birds in Asia is a concern, since it could mutate and combine with swine flu and become a human pandemic. The Swine Flu virus spreading in 2019- 2021 could combine with Bird Flu, creating a more deadly virus. Here we will apply astrology and the Revelation13.net theories to economics. How will the world economy and stock market do in 2019 - 2020? Here we will apply astrology, Biblical prophecy, numerical analysis, and the concepts of this Revelation13.net web site to economics. Could a worldwide economic crash and economic depression occur soon, including a worse world stock market crash? In September - October 2008 there was a major fall in the U.S. Stock Market that also affected European and other country's economies. But I think the U.S. stock markets (NYSE and NASDAQ) will do better than Europe and Asia. I think worldwide economic chaos could occur during 2018 - 2019, during the End Times Period when the Four Horsemen of the Apocalypse ride, with the Third Horseman being Economic Chaos. World economics will likely see wild swings, oil price instability, stock market swings in 2019 - 2021. But how about in the past, were there any particular planetary alignments during times of economic problems? Yes, there is a general pattern we shall discuss here. During the October 1987 and October 1929 stock exchange crashes, the Planet Saturn was in the Astrological sign of Sagittarius. The significance of this is that Sagittarius, the combined horse/man, with Saturn having a connection in Greek / Roman / Etruscan mythology to agriculture as well as weights and measures and coins, means that Saturn in Sagittarius represents the third Horseman of the Apocalypse, economic depression. When Saturn is in Sagittarius you may get the trigger event, such as a stock market crash, that begins an economic depression. (1) Saturn was in Sagittarius in 1782, when an economic decline began that resulted in economic depression in the U.S. from 1783 to 1787. (2) Saturn was in Sagittarius from 1838-1841, a severe economic depression, lasting seven years, began with the panic of 1837, caused by a series of bank failures. (3) Saturn was in sagittarius on Sept. 24, 1869, when a Gold Market panic, "Black Friday", began an economic decline that resulted in a severe recession for the U.S. 1873-1879. (4) The Panic of 1893 resulted in a severe recession until 1897, when Saturn entered Sagittarius, in this case at the end of the recession. Generally, the U.S. economic pattern of recessions or depressions every 30 or 60 years is related to the 29.4 period of revolution around the Sun of the planet Saturn. Also see this page on the King James Bible Code, and the stock market and world economy. Generally, the prophecies discussed on this site may be changeable, if people will understand and listen to them and take appropriate action, such as building an asteroid defense. This may be a test for the human race: if people will understand that the disasters described in Revelation are occurring, then it may be possible to change the future and avoid these disasters. In this web site I have tried to show how astrology, new age methods, religion, bible prophecy, the King James Bible Code, and mythology can be used in a combined way, to explain the world today and to predict the future. I try to find a middle way, between Christianity and New Age, because I think that is where the truth is. A middle way, as in Buddhism where a middle way between extremes is emphasized. And as in Hinduism, I have looked to Astrology and the stars for guidance. And the idea of a unifying religion is advocated here, as the Baha'i faith has a goal of unifying mankind; Baha'i is one of the most enlightened of world religions; begun in Iran, its world headquarters is in Haifa, Israel. And as in the Kabbalah, the spiritual and New Age branch of Judaism, I have searched for the hidden meanings in the symbolism of the Bible, and its numerical patterns. The truth is found by following the Middle Way between religions, and that is the path I have tried to follow here. John 8:32: "And ye shall know the truth, and the truth shall make you free". 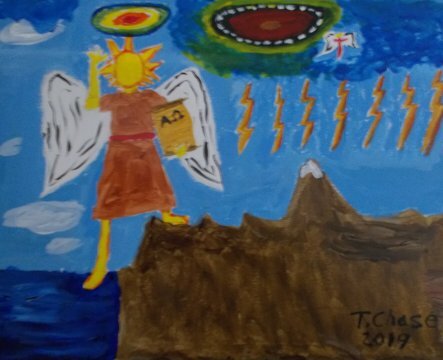 Title: "Revelation13.net: Astrology, Prophecies of the Future, Bible Prophecy and the Book of Revelation, the King James Bible Code"
If you would like to use a banner in your link to my site, there are several at this page. And book publishers: I am interested in publishing a book based on this Revelation13.net web site. Please email me if you would like to discuss publishing my book. Also, movie producers and TV networks: please email me if you are interested in doing a documentary program or TV show on my prophecies and theories. My name is T. Chase, and I live in the U.S.. I grew up in the U.S. as a Christian Protestant, and I am of English Anglo-Saxon ancestry, but today I would call myself a New Age Christian. This site is a one person effort by me, and the theories and opinions expressed on this site are my own. I have worked on my theories for 20 years, and I started a web site in 1998 to explain my theories to the world. I would like to expand this site to have it translated into other languages. A multi-language site in 5 or 10 languages is my dream: in French, German, Spanish, Swedish, Dutch, etc.. But I don't know other languages myself, and translation of this site to other languages would cost a lot of money, since I would have to have professional translators do it. I have little money myself. This site is a one person effort by me, T. Chase. There is much I would like to do for this site, if I had the money to. If I had $1 million, I could do much for this site: translation to other languages, advertizing, publish a book, add sound and video. If anyone would like to give me $100,000 or more to help with improvement and advertizement of this web site (translation to other languages, advertizing, promotion, publish a book, etc.) then please email me. Another way to help this web site would be to mention the Revelation13.net web site in your Last Will and Testament, if you have $100,000 or more you wish to bequeath to this Revelation13.net web site and T. Chase. That will help me get the word out. "Moreover concerning a stranger, that is not of thy people Israel, but cometh out of a far country for thy name's sake;"
The "T" in my name was at the "t" in "stranger". You will see on this site that I am one of the millions of American Christian supporters of Israel. And also, concerning this web site, this New Testament King James Bible Code matrix, at John 14:23 - Revelation 7:9, was found by searching for REVELATION THIRTEEN (since "Revelation13.net" is the name of this web site), my name TCHASE, and also note in this matrix there is: WEB (as in web site), AND WE HAVE SEEN, LOOKING FOR THAT BLESSED HOPE, THE SPIRIT OF THE WORLD, TO SPEAK UNTO THE PEOPLE, THEY TOOK KNOWLEDGE, BE REVEALED, THE TRUTH. I think these words describe what this web site Revelation13.net is about. John 8:32: "And ye shall know the truth, and the truth shall make you free". On psychic powers: I am an amateur psychic. You can watch on this page videos where I demonstrate telekinesis, how I use my psychic telekinetic power to make clouds disappear at will.
" -- I would see you as the pied piper, the guide, the person that is probably more psychic than any of the psychics you have gone to in your life. -- As you go through life you are supposed to share wisdom. Your destiny is to teach, to lead, to be the guide. It is said that when the student is ready to teach you shall appear. That you move by Mars and Pluto, which is a sign of the upheaval." Bible quotes are from the King James Version Bible. "I came, I saw, I built a web site." Third Party vendor ads on this Revelation13.net web site may be using cookies to serve ads on the web pages of this web site.